This is the second edition of this popular guide. It has been extensively updated to include new features and changes to the underlying technologies; and extends the coverage to encompass Microsoft Azure® Access Control Service, REST-based service authentication, and the use of claims-based authentication in Microsoft SharePoint® 2010. As you'll see, claims provide an innovative approach for building all types of applications that must authenticate and authorize users. Although claims-based identity has been possible for quite a while, there are now tools available that make it much easier for developers of Windows-based applications to implement it. These tools include the Windows Identity Foundation (WIF), Microsoft Active Directory® Federation Services (ADFS) v2, and Azure Access Control Service (ACS). This book shows you when and how to use these tools in the context of some commonly occurring scenarios. 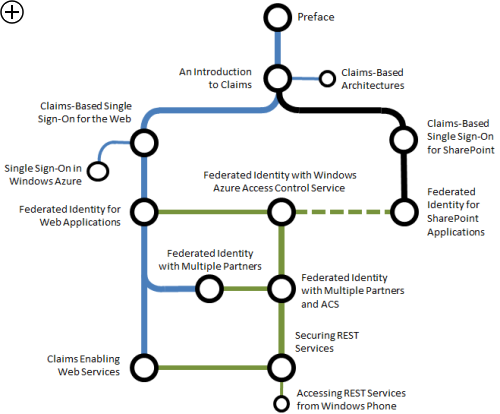 Claims-Based Single Sign-On for the Web and Azure is the starting point of the path that explores the implementation of single sign-on and federated identity. This chapter shows you how to implement single sign-on and single sign-out within a corporate intranet. Although this may be something that you can also implement with Integrated Windows Authentication, it is the first stop on the way to implementing more complex scenarios. It includes a section for Microsoft Azure™ technology platform that shows you how to move the claims-based application to the cloud. Federated Identity with Microsoft Azure Access Control Service is the start of a parallel path that explores Azure Access Control Service (ACS) in the context of single sign-on and federated identity. This chapter extends the scenarios described in the previous chapter to enable users to authenticate using social identity providers such as Google and Windows Live® network of Internet services. Federated Identity with Multiple Partners and Microsoft Azure Access Control Service extends the scenarios described in the previous chapter to include ACS to give users additional choices for authentication that include social identity providers such as Google and Windows Live. Note: The example code for this guide and for the associated Hands-on-Labs was built using the Azure Tools for Visual Studio version 1.3 (March 2011), and has also been tested using version 1.4 (August 2011) of the tools. The Dependency Checker utility provided with the examples will check for the presence of either the version 1.3 or version 1.4 release of the tools. If you have version 1.4 installed, you will be prompted to migrate the solutions to this version when you open them in Visual Studio.